"The Legend of Mike Severs"
Five dollars and a gallon of whiskey at The Battle of New Orleans. In December of 1814, after learning that fifty British ships had sailed into Lake Borgne near New Orleans and deposited more than eight thousand troops, General Andrew Jackson rushed to defend the city and to protect the entrance of the Mississippi River. Jackson, who had expected the British to attack Mobile Alabama, maneuvered into a very defensible position at Chalmette Plantation (about six miles from New Orleans) and made his stand.The British advanced too slowly and cautiously. Thereby losing much of their advantage. 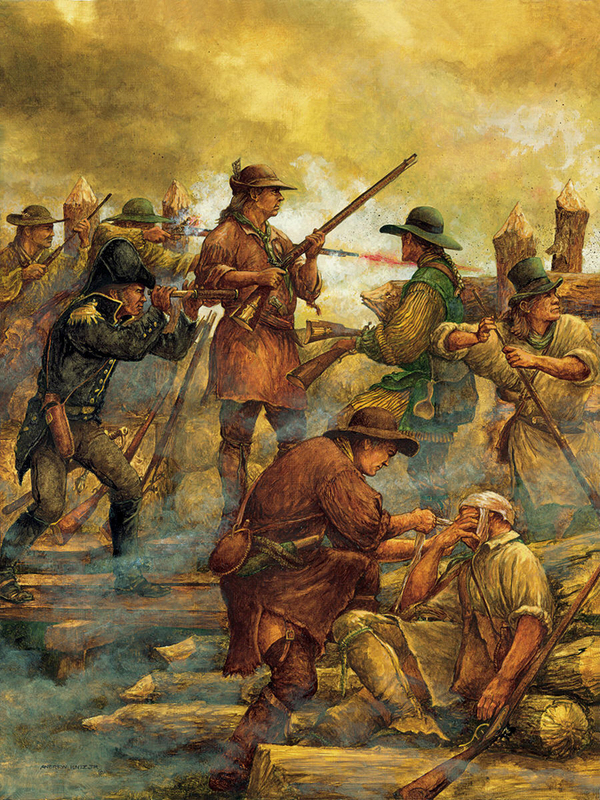 Numerous engagements occurred between portions of the opposing armies with neither being the clear winner, but Jackson with a small force of regular troops, militiamen, seamen, citizens, Choctaw Indians, free blacks and pirates under the command of Jean La Fitte (a force totaling about two-thousand men) delayed the British advance long enough for twenty-three hundred Kentucky militiamen to arrive to bolster his numbers on January 4, 1815. Among these Kentuckians was Michael Severs, who had run all the way from Kentucky to beat his mounted fellow militiamen by three hours to win a bet. Surprisingly, many of the Kentuckians arrived without guns, warm clothing or equipment. General Jackson is quoted as having said “I never in my life seen a Kentuckian without a gun, a pack of cards and a jug of whiskey”. Jackson instructed the people of New Orleans to search for any hunting rifle, pistol, weapon or equipment that they could find to arm the Kentuckians who had come to their aid. They responded enthusiastically and the women even sewed hundreds of garments to help. The commander of the British forces, General Edward M. Pakenham, had only taken command of his troops on December 27, 1814. He had inherited a less than ideal situation, but was determined to succeed. The topography of the land greatly favored Jackson’s men. A cypress swamp on the northeast and the Mississippi River on the southwest forced the main thrust of Pakenham’s attack up a twelve hundred-yard wide sugarcane field. The water filled Rodriquez Canal ran across this field, above which, Jackson built his main defensive breastwork of mud and logs. Pakenham, trying to make the best of a poor tactical situation, divided his main force into two brigades; with the extreme right wing under Major General Gibbs near the swamp and Major General Keane’s men on the opposite side of the field near the river. The main thrust of the assault was to be made by Gibbs against the left side of Jackson’s line, which was perceived to be the weakest. That end of the line was defended by the Tennessee and Kentucky militias. The 44th, an Irish regiment, was to form the advance unit of Gibbs’s troops, and carry with it six long ladders with planks on them, ten small ladders and fascines. The 44th either misunderstood or neglected their orders and at the time of the assault, left these crucial items behind, leaving them with no way of crossing the water filled canal or scaling Jackson’s breastworks. When Pakenham gave the order to advance, the other regiments charged forward, leaving the 44th, the ladders and the fascines behind. Soon Gibbs's men began to falter under the Americans withering fire. Major Lacarriere Latour of Jackson’s staff states: “Batteries Nos. 6, 7 and 8 now opened an incessant fire on the column, which continued to advance in pretty good order, until in a few minutes, the musketry of the troops of Tennessee and Kentucky, joining their fire with that of the artillery, began to make an impression on it, which soon threw it into confusion”. The Kentuckians stood in two lines, ready to take the places of two lines of Tennesseans as soon as their pieces were discharged. This made four rotating lines, which poured a continuous fire into the advancing columns. Perceiving that Gibbs's men were faltering, Pakenham diverted the majority of Keane’s men to Gibbs's aid. They executed a right oblique in order to reach Gibbs. Keane’s men incurred devastating casualties while crossing the open field in front of Jackson’s line, however, they managed, with some of Gibbs's men, to reach the canal in front of the American defenses. It was impossible to scale the muddy slopes without ladders and the Americans simply swung their weapons over the edge of the ramparts and fired down upon the British without even exposing themselves. At the same time, the American batteries were cutting huge gaps in their flanks. Seeing that Gibbs's men were refusing to continue on into certain death, Pakenham rode forward to rally his men shouting “For Shame! Recollect that you are British soldiers!” Pointing to the front, he shouted, “This is the road you ought to take!” Hat in hand, about two hundred yards from the American lines Pakenham was hit. Major James Hunt, from Franklin County, Tennessee, stated in his diary that while the British were still technically out of rifle range, he personally saw Michael Severs rise from behind a cotton bale, and with two of his companions loading for him, Michael fired his long musket (rifle) twenty six times and Hunt saw twenty six men fall. As the British attack started to falter and some of the gun smoke disappeared, Hunt noticed a figure of a British officer surrounded by a group of other officers. Taking this to be a man of some rank, he shouted to Michael Severs a Question . . . If Major Hunt could mark down a man, could Michael Severs hit him from this distance. Severs, in the act of reloading said he could hit anyone, if . . . Major Hunt or General Jackson would pay him five dollars cash money, not paper, and would give him a gallon of his best whiskey for himself and a half barrel for his companions (The above comes straight from Major Hunts diary). Hunt agreed and pointed out the man. Michael Severs, wearing buckskins and his floppy hat, laid five muskets (rifles) across the top of a cotton bale and after testing the wind with a wet finger took aim down the barrel of the first weapon. He fired, and then almost immediately fired the second and third and fourth. According to Major Hunt, the firing of the guns seemed to fall still just as Michael fired his first gun. Through his spyglass, Major Hunt saw the man reel in his saddle with the first shot and jerked twice more after each successive shot. The man fell off backwards and was caught before he hit the ground and was quickly carried away. The British account of Pakenham’s death states that he was hit in his right arm and knee. Another shot felled his horse. His aide-de-camp, Major Duncan Macdougall, quickly dismounted and helped Pakenham mount Macdougall’s horse, which Pakenham did with difficulty. With a shattered right arm, he could not hold the reins, and Macdougall, on foot, led the horse forward, with Pakenham astride it, shouting, “Come on, brave Ninety-Third! (A Highlander regiment)”. Seconds later he was struck again, this time in the spine. He toppled from the saddle and fell into Macdougall’s arms. Unconscious, he was carried away from the line of fire and placed on the ground, under a large oak tree, where he was examined by a surgeon, who pronounced the wound mortal. Moments later General Pakenham was dead. The British offensive fell apart and shortly after noon, the then ranking British officer, Major General Lambert, a bugler and a soldier carrying a white flag approached Jackson’s lines and requested a twenty-four hour cease fire. After some delays, Jackson agreed to cease hostilities until noon the next day on the east side of the river, to collect the wounded and bury the dead. Eventually, Lambert silently withdrew his men and sent a note to Jackson stating that he had yielded the field. Unfortunately the battle had been fought fifteen days after a peace treaty was agreed upon in Belgium between the United States and Great Britain. Michael Severs collected his money and liquor and, on foot, beat his friends back to Muhlenberg County Kentucky. He was highly esteemed, especially by the local men who took part in the War of 1812. Every time he came to Greenville Kentucky, such men as Alney McLean (whose militia company Severs was a part of) and Charles Fox Wing prevailed on him to be their guest while in town. Although clad in buckskin breeches and hunting shirt, and often without shoes, he was always placed at the head of the table and given the best room in the house, regardless of other guests.In later years he was granted a pension of three dollars a month for his exploits at the Battle of New Orleans. The bones of this old hunter who was the father of nine children, rests in the Duke and Whitehouse burying ground near Bevier, Kentucky. A marker was never erected over his grave, but the cemetery sits on a hill overlooking Lower Pond Creek, near Severs Ford.